reveals the heart of miracles. explores biblical and present-day accounts to stir your faith. shows how God works in believers to invade the natural with the supernatural. provides principles and tools to help you welcome the miraculous. looks at how we become a conduit for God to do miracles through our lives. identifies how to walk through times of crisis from a biblical perspective. "This book will help you understand in a very practical way your role in seeing God do the impossible in your life." --Sam Rodriguez, president, National Hispanic Christian Leadership Conference; founder and lead pastor, New Season; bestselling author, Be Light. 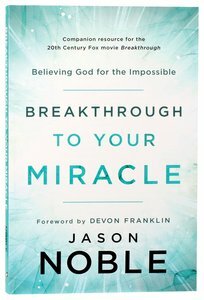 About "Breakthrough to Your Miracle: Believing God For the Impossible (Companion To Breakthrough Movie)"
:Throughout his ministry, Pastor Jason Noble has witnessed miracles. And he was there when John Smith--a young boy who had fallen through ice and been declared dead--walked out of the hospital two weeks after being surrounded by prayer. Why, he asks, don't believers see more wonders like this one?